"We are continuously evaluating our vendors and assigning preferred vendor status to the best performers. The target is to consolidate our spend to our best performing vendors. The Norican preferred vendor program is the opportunity for you to develop your business with Norican Group. Help us to grow your business by partnering with Norican Group. If you would like to know more about the Norican preferred vendor program and how to become a Norican Preferred Vendor, contact your local DISA, Italpresse Gauss, StrikoWestofen or Wheelabrator partner and make sure you are part of the process." Find your nearest Norican representative here. Norican Group is home to four leading, globally operating technologies: DISA, Italpresse Gauss, StrikoWestofen and Wheelabrator, all strengthened by Norican Digital. 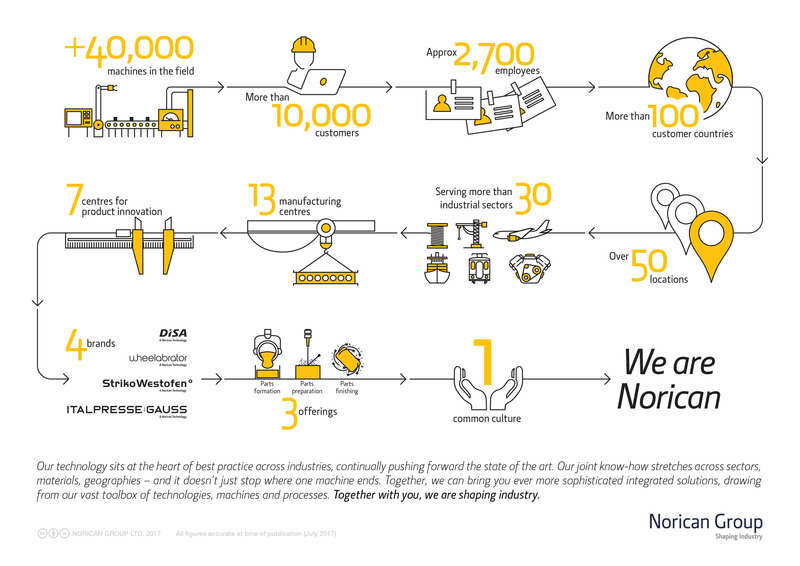 Continue to the About Norican page here or view the Norican infographic below.